Differential pressure measurements provide a reliable metric of baghouse performance. Just as a doctor uses a thermometer to check for fever, so too can maintenance personnel use gauges to measure pressure drop across a baghouse. When the differential pressure readings fall too high or too low, it’s a clear indication that it's time to make adjustments. Differential pressure can warn us when the baghouse needs help. 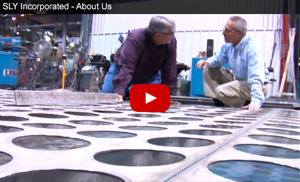 It can be as simple as indicating when it’s time to pulse clean filters or more extensive service, like it’s time to replace the filters. Continuously monitoring pressure drop can reveal problems early, when they are faster, easier and cheaper to fix, and helps extend bag life. Differential pressure is defined as the pressure drop measured across the tubesheet (the metal plate from which the bags are suspended), from the dirty side of the bags to the clean air plenum. To find this difference in pressure, the lower, clean air pressure inside the bags is subtracted from the higher, dirty air pressure outside the bags (see image). Rapid changes in differential pressure can indicate physical changes in the filters. A sudden drop in differential pressure can indicate that a filter leak or rupture has occurred. A sudden increase in differential pressure can indicate that the cleaning system has stopped functioning or a material discharge device has stopped working correctly or dust particles have been entrained in the filter’s fibers and unable to be removed by the dust cleaning cycle (filters have become blinded). 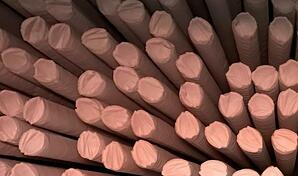 Baghouse filters act somewhat like window screens that prevent insects from entering a room. Incoming baghouse air passes through the filter medium, which captures the solid dust particles on the exterior of the filter bag. A seasoned bag refers to a surface of accumulated dust which remains after pulse cleaning (Dust Cake). This layer of dust helps to capture more dust because new dust clings to old dust. In fact, air filtration through the combination of the dust cake and the filter medium provides the highest particulate removal efficiency. However, there's a practical limit; a baghouse can't run well when the dust cake is too heavy. Differential pressure is a measure of resistance to air flow across the filter bags. As air passes through the dust layer and the filter medium, it loses the dynamic or velocity component of pressure. Eventually, as dust builds up on the bags, there is greater resistance to air flow and the volumetric flow rate decreases. 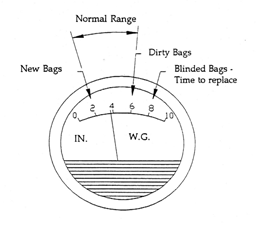 A change in differential pressure can also reveal the condition of the bags, whether they are in good working order, approaching the end of useful life, or blinded and therefore, ready to be replaced. See Table 1, where "w.g.” is the pressure drop measured in inches of water gauge. New bags 0” to 2" w.g. Seasoned bags 2” to 5" w.g. May be nearing end of life >6" w.g. When newly installed, felted filter bags have the lowest pressure drop because the media has the greatest permeability before seasoning by dust. These bags are not fully efficient until they have accumulated a minimum dust thickness, along with a slightly higher pressure drop. Over time, some dust particles will become entrained in the bag’s fibers so they can’t be removed by the pulse-jet cleaning cycle. In other words, the bags become blinded. After the initial bag conditioning period, or seasoning, baghouse differential pressure should stabilize into a consistent operating range relative to the cleaning cycle, application, and style of equipment. This range can be used to predict the expected differential pressure with future bag changes. In contrast, baghouse filters with a microscopic PTFE membrane rely on surface filtration to remove incoming particles. The PTFE membrane works as the primary filter cake, collecting all of the particles on the surface, so they can’t penetrate the filter fabric, which can lead to reduced airflow, and filter “blinding.” The membrane also makes these bags more efficient and easier to clean. During pulse jet cleaning, a reverse flow of clean compressed air puffs a row of bags outwards, dislodging the dust cake on each bag’s surface. The dislodged dust drops into hoppers located beneath the bags. During this cleaning cycle, the bags in the row being pulsed do not inflate all at once, but in a wavelike manner, which enhances cleaning. The bags react to the initial shock of compressed air, followed by a bubble-like expansion that moves along the bag length. In order to reduce re-entrainment of pulsed dust, adjacent rows of bags are not pulsed in sequence. During the cleaning procedure, the baghouse remains online, and filtration continues, with no downtime required. Modern baghouse pressure gauges include Magnehelic® differential pressure gauges (diagram on right), photohelic switch gauges, or solid state differential pressure controllers. Baghouses with Magnehelic differential pressure gauges are cleaned by time sequence and these gauges have no electronic control capabilities. However, Sly’s policy is to include one of these gauges in every baghouse design because they offer a quick, convenient way to check pressure visually. 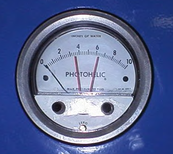 The gauge indicates the air pressure inside the baghouse, and operators should check the gauge regularly and record the pressure manually. Photohelic switch/gauges combine the function of a Magnehelic differential pressure gauge with low/high pressure switches. Two phototransistor-actuated, double-pole, double throw relays are used to set low and high differential pressure setpoints. Setpoints can be interlocked to provide control of the pulse jet filter bag cleaning system. The advantage of the Photohelic switch/gauge is that it triggers the cleaning system automatically, running it only when needed, based on a preset differential pressure level, which helps reduce operating costs. Compact, solid state differential pressure controllers have a digital display rather than an analog dial utilized on the photohelic pressure gauge. These solid-state devices are easily installed and allow for fine control of high and low limits to activate “on-demand” cleaning of baghouse filters. 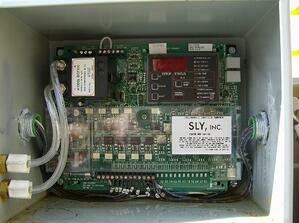 Sly utilizes a module designed to plug into the baghouse control system’s timer board. Solid-state controllers use a 4-20mA signal capability for remote monitoring of pressure differentials. In addition, they send an alarm to notify technicians when the pressure goes outside the preset levels. Regular logging of baghouse differential pressures is the best way to monitor the performance of your dust filtration system allowing you to take corrective actions sooner and at less expense. If you need help in bringing your baghouse back to health, Sly, Inc. is always ready to help. With almost 150 years of dust collecting expertise, Sly can help you ensure your baghouse is running at maximum efficiency. Contact us for more information about measuring and logging differential pressure to maintain and protect your baghouse’s performance.